Cissy Houston has revealed Bobbi Kristina Brown is “not progressing at all”. Cissy’s 22-year-old granddaughter Bobbi Kristina was placed in a medically induced coma after being found unresponsive in the bathtub of her Roswell, Georgia home on January 31. And although she isn’t in the coma any longer, her 81-year-old grandmother has lamented over Bobbi Kristina’s lack of medical improvement. 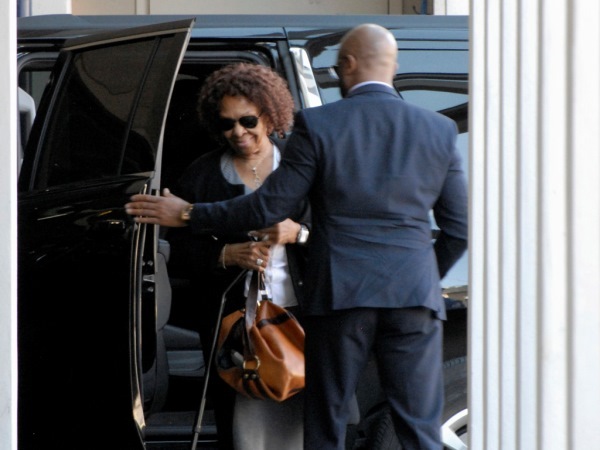 "She's the same, she's not progressing at all," Cissy told Entertainment Tonight. "She's not gone yet, but you know, whatever the Lord decides, I'm ready for her... I have nothing to do with that. That's His job. It's His territory, you know? And I understand it." Cissy’s statements come one day after a judge appointed Bobbi Kristina’s father Bobby Brown and aunt Pat Houston as her legal co-guardians. Both Pat and Bobby, who shares his daughter with the late Whitney Houston, will be making medical decisions for her while attorney Bedelia Hargrove oversees Bobbi Kristina's financial and legal affairs. There were rumours the Brown family were feuding with the Houstons over how to care for Bobbi Kristina since she was admitted to hospital. And Cissy is happy an agreement over this matter was finalised in court. "It came alright, It was fine," Cissy noted. "We're a family…that works together for the best. You want the best for whomever or everybody we can…We can be on the other side too if you make us be but we are not going to do that. There's no reason for that. That's why I'm concerned. So, that's the end of that." Cissy appreciates all the support the family is receiving from fans. She believes prayers and well wishes for Bobbi Kristina are helping her brood through this tragic situation.